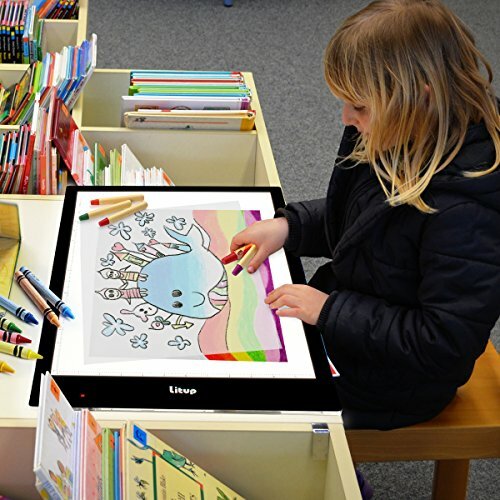 For this post, I have put together a collection of the best light tables currently available. I have included a range of prices to hopefully help you find one that fits in your budget and is the required size. The following light tables use the latest innovative components to meet your needs and help to ensure you do your best work. 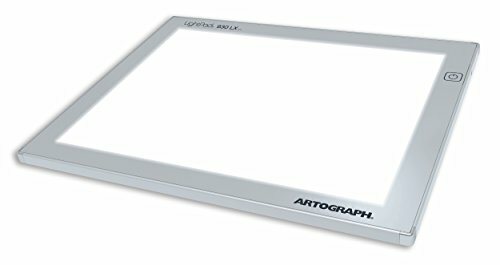 So here is my list of The 10 Best Light Tables. 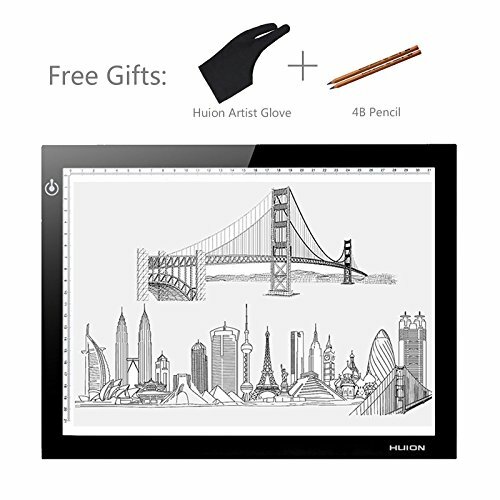 Check out this brief video overview on using a light table, it features the Huion L4S (#8 below). 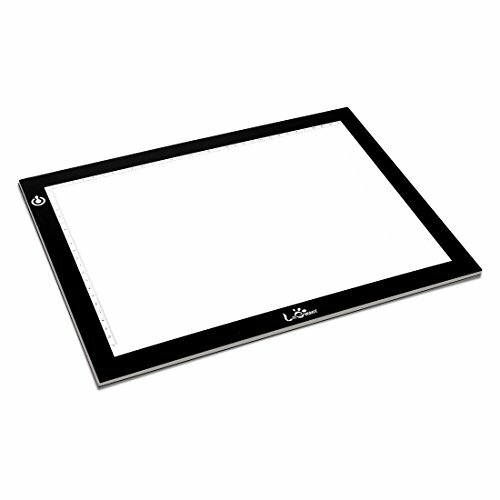 Professional Quality Ultra-Thin Light Tracing Pad with Dimmable Touch Button Technology. Super Bright Energy Efficient Flicker-Free L.E.D. Lamps that are Maintenance Free and Last up to 50,000 Hours. 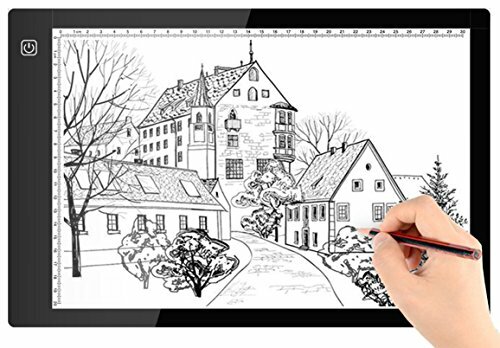 Ideal for Stenciling, 2D Animation, Calligraphy, Embossing, Scrapbooking, Tattoo Transferring, Sketching & Drawing, Sewing projects, Stained Glass, Quilting & More. 1-Year Unconditional Full Replacement Warranty. Comes with light pad, measuring overlay grid and circle template/protractor. Illumination is dimmable with 3-level adjustable brightness. Simply touch the pad to turn on / off the light pad. Adjust the brightness by simply pressing the touch switch for several second until you get the desired brightness. Memory Feature smart memory the brightness of your last use. Easy to use USB cable power supply. Sleek, contemporary design makes it incredibly versatile and user friendly. 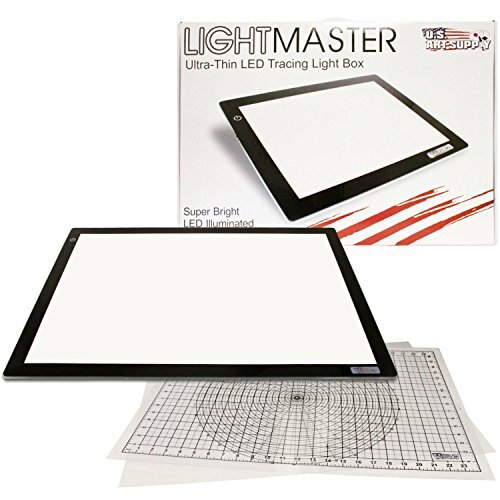 Thin 17-inch-by-24-inch lightbox offers bright consistent light throughout the work surface. Fantastic tool for artists, calligraphers, cardmakers, sewing, quilting, embossing and an endless variety of papercraft. Utilizes the latest in advanced super bright led technology which allows the lightpad series to shine brighter, run cooler and use less energy. LED lighting provides up to 50,000 hours of maintenance free creative brilliance. Includes a durable storage bag and an AC adapter. Only 5mm thick which makes it extremely portable. Illumination is perfectly even, super bright, and flicker-free. Comes with a USB cable, easily power the light box from any Computer, Power Bank or USB Plug that connects directly into a wall outlet. The light is stepless adjustable, so you can set it to to your preference. Flicker-Free super bright eco-friendly Led. Ideal for Stenciling, 2D Animation, Calligraphy, Embossing, Scrapbooking, Tattoo Transferring, Sketching & Drawing, Sewing projects, Stained Glass, Quilting. Maximize your ability to easily trace onto tracing paper and thicker papers too. Power/dimmer button was placed out of the way to eliminate accidental shut off. 21 built-In super bright, energy efficient & flicker-free LED mini bulbs rated for 50,000 hours. Advanced filter blocks the LED light spectrum range that causes eye pain and soreness while still providing true to life picture perfect images that can be easily traced. 9”x13” A4 size easily fits into your backpack or computer case. Made of super durable acrylic witha heavy duty long 6ft USB cord. Very slim light pad with a thickness of only 0.67”. Portable and easy to carry with you everywhere. Features and aluminum frame for lightweight durability. Offers light-diffusion technology that provides high brightness and is flicker-free. 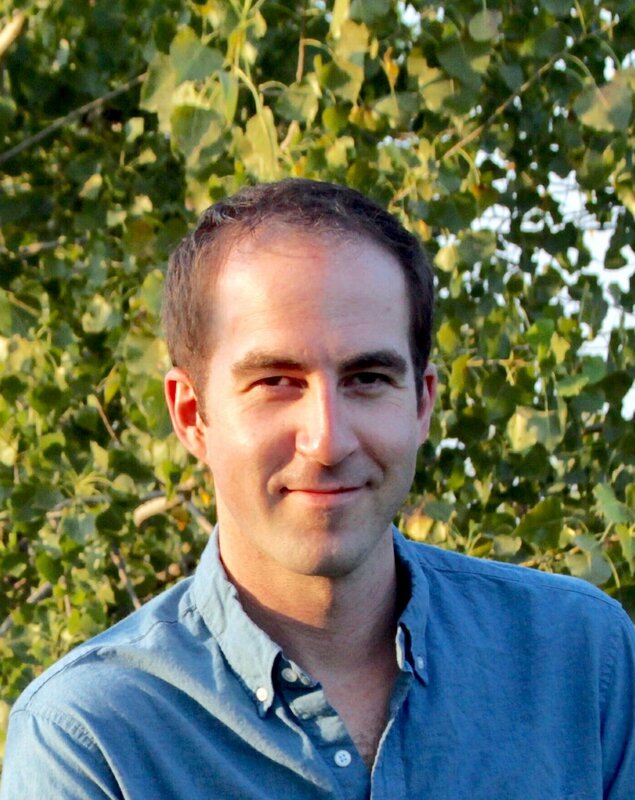 Touch of the on/off switch to adjust the brightness level and shut off the device. Battery Powered and USB Powered: Work wireless when in battery mode. 5 hours of continuous use when fully charged. Full charge time 1.5 hours. 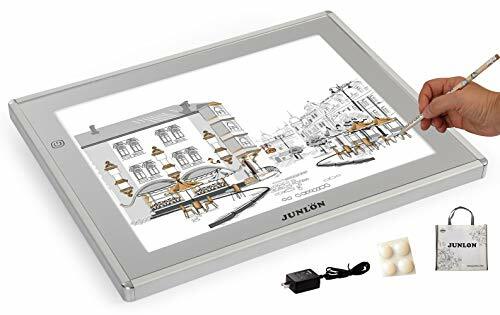 Huge Capacity: L16.54-by-W11.81 inch, A3 size light box is large enough for Drawing, 2D Animation, Embossing, Sketching, Tattoo Transferring, Magna-tiles etc. Adjustable Brightness: Touch switch design to adjust the light intensity. The maximum brightness is 2280 Lux in USB mode and 1500Lux in battery mode. A 2-meter USB Cable and a USB Wall Charger Included. Long Life Span and 18 Month Warranty. 50,000 hours of continuous use. Apart from the super slim profile, it weights only 0.61 kg and 5.1mm thick, which makes it easy to carry around. Use regular print papers with the dimmest lighting, it's easy to see through all the FOUR layers. Lighting lasts up to 50,000 hours. Gains very little heat when using, suitable for long-hour working. Ideal working lighting environment for penmanship and design. 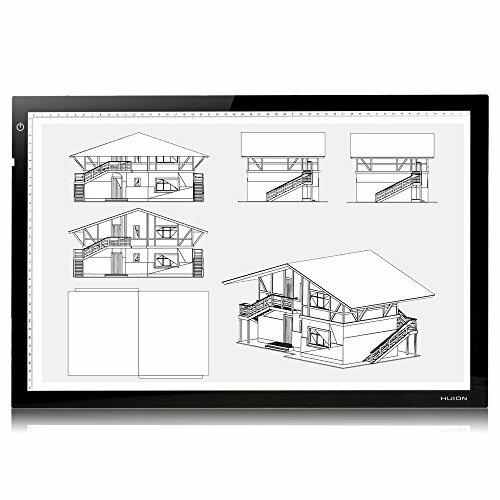 Provides the most comfortable lightning environment for animators, designers, art enthusiasts. Dimmable touch button technology helps to achieve the ideal light level. Super thin and super convenient, masterpiece design. Used for Stenciling, 2D animation, Calligraphy, Embossing, Scrapbooking, Tattoo Transferring, Sketching, Drawing, Sewing Projects, Stained Glass, Quilting, Enhanced Visualization and so on. Print scale for measurement, easy for drawing. 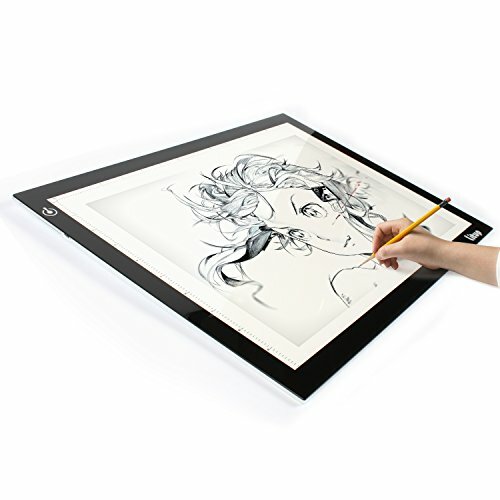 Large Working Area and Huge Capacity: 15.63-by-11.81 inch (B4 size) larger than A4 size and it is widely used in drawing, animation, stenciling, sketching, embossing, tattoo transferring or X-ray viewer etc. Thin and Portable: LP-B4 led light box has the slim thickness of 0.2 inch and the weight of 0.74 KG which make it easy to be carry around. Adjustable Brightness: LP-B4 light pad has a touch switch to control the brightness. 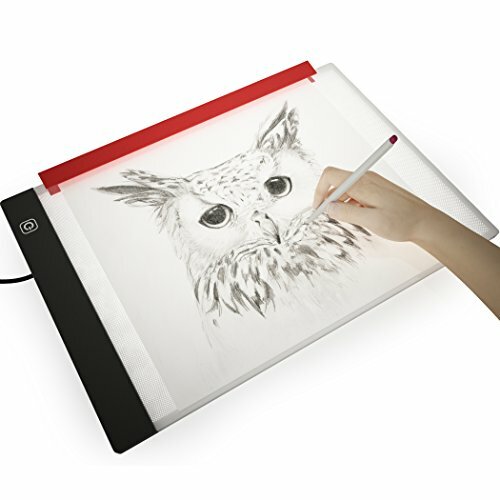 The bright led lamps inside the tracing light box provide perfectly even illuminated surface. USB Powered: LP-B4 light board comes with a 2-meter USB cable which can be plugged into USB wall charger, computer, laptop or power bank etc. Eyesight Protected Technology: Non-flicker led lamps provide even light and there is no shadow, no eye strain when using the light box. I hope this list has been helpful, if I left out a light table you think is important, let me know in the comments below.